Well, we knew that internet would be harder to access in Indonesia, as we planned to be in quite remote areas, but didn't know it would be non-existent for weeks! 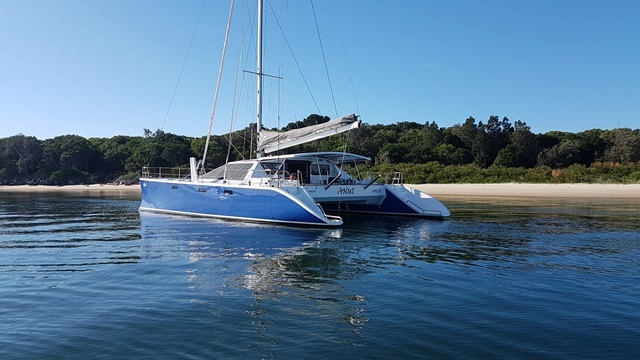 This mini-blog is being brought to you in relay from us on Anui off the West Papuan coast via my sister in England who is kindly uploading this. Since we last wrote from Bitung, we've travelled South East through the Moluku region of Indonesia and down the West coast of Halmahera. We visited the lovely small island of Tifore, where the school master and half the village's 103 kids showed us around. We stopped for a few days at the volcanic island of Ternate, where the town hugs the bottom of the currently smoking volcano (!) and the people presumably hope that nothing worse happens. We were a rare thing in the town and got mobbed when we went to the market to stock up. Finn didn't like it at all and has since refused to go to any towns at all. The coastline is not particularly pretty and the anchorages are not particularly appealing so we have been moving on fairly rapidly. Plenty of fishing boats and canoes approach the back of the boat and that's when we really know we're back in Malaysia. It's not unusual to have 10 or more lots of visitors one after the other - they mainly just want to have a look and exchange smiles but sometimes men or older teenage boys think they'll have a go at stepping onto the boat, which we put a stop to. They are usually friendly and we are trying to get used to being stared at from a few metres away while we try to eat breakfast/ do the washing/ do school. We're about to head into the Wageo group of islands, which apparently have great snorkelling, diving and hiking - bring it on! We haven't been to a nice beach since Lankayan island, which was a month ago, so we're desperate. We hope to spend a week around Wageo and then go the town of Sorong in West Papua to stock up again and chase up the usual round of spare parts. There must surely be internet access there?! Continuing to have fun I see! I notice both you and Seth mention seeing a school but no mention of entering one lol! Glad to see people have respected your no boarding policy. Enjoy the sand when you get to a nice beach - it's way too wet and cold here for that. Hi all - and especially John and karen, whom we haven't seen in years! Great to hear from you and glad you have seen Lankayan - isn't it beautiful? Send us your email address if you get the chance. Our email is on this site.